Summer’s Keep compels us to pay closer attention to the tremble of life as it moves through our circumstances; revealing to us the wonder and magnificence of a merciful God. Seeking to break free of the constraints placed on him by his prestigious blood line, Gage Barrington sets out to live life on his own terms. On a South Carolina coastal island, he meets Shanna Muir who challenges his ideas about life, love, and true freedom. After the loss of her husband, Shanna Muir struggles to adjust to life without him. Landing a job at a nearby marina, she quickly finds her private life entangled with the strong-willed owner, Gage Barrington. Once she begins to penetrate his cool reserve she realizes Gage’s heart is as encompassing as the sea. 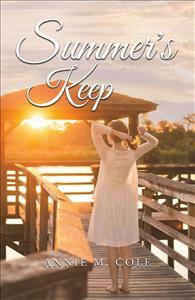 Summer's Keep had a way of transporting me to another place with characters that I found myself falling in love with. I would get anxious to know what was coming next for them. This book had just enough suspense to keep the pages turning and before I knew it, the story came to a close. I truly missed this book once I finished reading it and found myself thinking about these characters, albeit fictional, in my daily life. It is a must read novel with a powerful message that brought everything together beautifully.